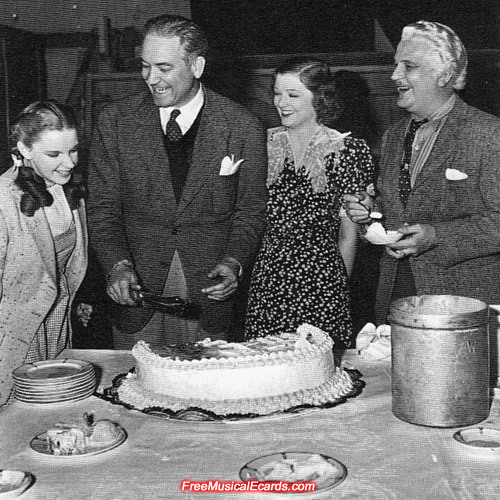 The cast and crew of The Wizard of Oz threw a "going away" party on the set of The Wizard of Oz for director Victor Fleming on 17th February, 1939, who is leaving to direct Gone with the Wind. A new director was brought onto the Oz project to finish the film. Fleming turns 50 in a week, and the party was also a celebration of his upcoming birthday. There's a lot of very interesting things going on in the photo above so let's touch on them briefly. 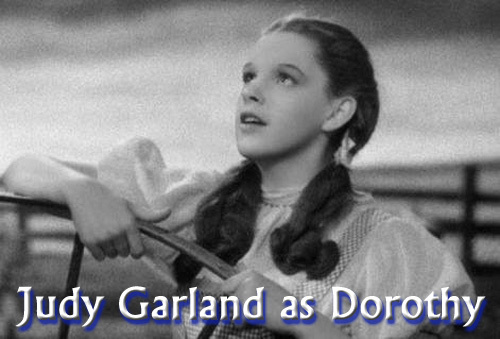 - Firstly, it's interesting that Judy Garland's hair is in pigtails, and she and her stunt double Bobbie Koshay are still wearing their checkered Dorothy dress to the party, as though they just came out of shooting for the day. Margaret Hamilton is also in her costume without the witch's hat. - Some of the main characters are noticeable in this photo. They are: Margaret Hamilton (Wicked Witch of the West), Bert Lahr (Cowardly Lion), Frank Morgan (Professor Marvel) and obviously Judy Garland (Dorothy Gale). - The cake looks big enough for everyone, and there's also a big tin of ice-cream which some people are eating. - The Wizard of Oz character maquettes (models) on the table looks awesome. - Notice the peculiar eye glare among some of the party goers? Judy Garland glaring at Margaret Hamilton, Bobbie Koshay glaring at Judy Garland, Margaret Hamilton glaring at a lady, and Frank Morgan glaring at somebody on his side. It seems nobody is happy that Victor Fleming is leaving. 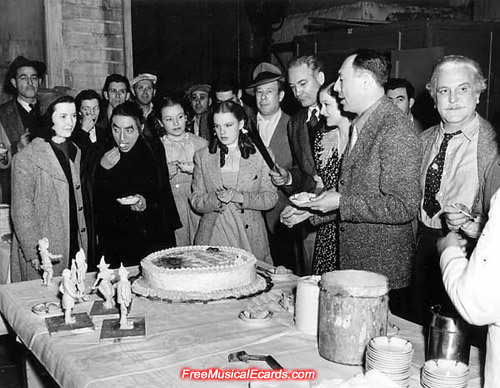 - Victor Fleming is holding a machete and he is just moments away from cutting his cake. A much happier moment. Smiles all round as Judy Garland, Victor Fleming, Myrna Loy and Frank Morgan enjoy the celebration on the set of The Wizard of Oz. 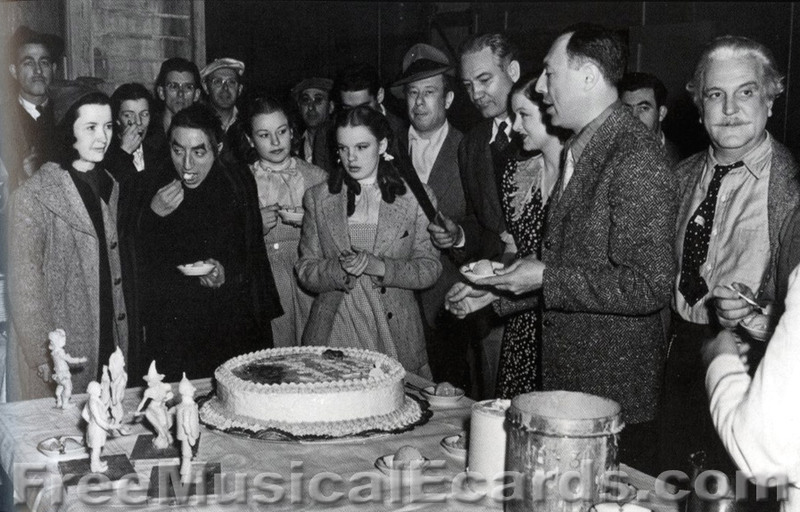 Judy Garland must be hungry for a piece of cake! 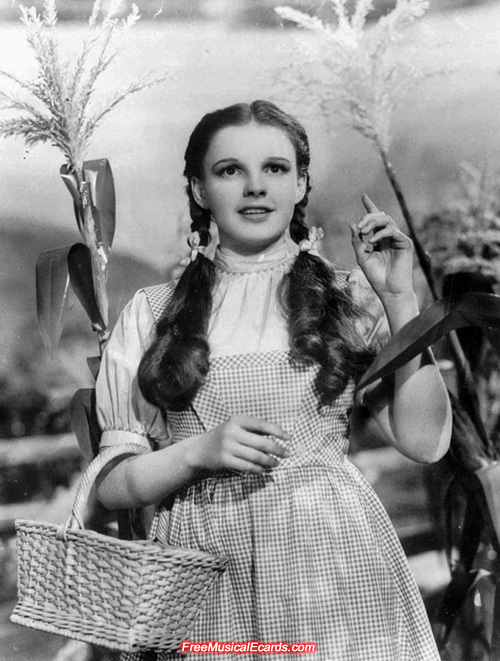 Judy Garland as Dorothy promotional photo. You know what Dorothy can have the whole cake because she deserves the whole cake after going through all those strict diets ;). Cake is just junk. Health-wise, it won't do anything but make her fat. A piece of cake is enough for her on special occasions like this.